Daytona Hodson believes teens should use their voice. He’s taught us so much, from the inventive way he never loses his auto-injector to his unique approach to educating teachers. He takes every opportunity to bring food allergy awareness to the forefront, which has gained him numerous awards, including the upcoming Teen Achievement FARE Vision Award. He’s a Spokin teen ambassador who has been with us since launch day! We may not be your parents, but you said something that made us really proud. As a teen, I want the ability to have control of my own choices involving my food allergies. All teens go out with their friends and have to decide what’s safe, and I need and want to have that responsibility. How has Spokin made your life easier? On the last day of school this past year my friends picked a restaurant for us to go to that I knew wasn’t safe for me. Instead of missing out, I was able to use the location feature on the Spokin app. It showed me several restaurants nearby that were safe. I texted my friends a few of the options and we picked a new place. Teens want to go out with their friends, and the Spokin app gives them the ability to do that. Seeing my options makes me feel much less limited. What are other ways you can gain control over your food allergies? I recently learned about the Spokin auto-injector manager. It was so easy to use and gives me more accountability in my allergy management. Keeping up to date with my auto-injectors isn’t all on my mom anymore. I definitely feel like I have a greater sense of independence because of Spokin. What’s a unique superpower of food allergic teens? There’s something powerful about a food allergic teen speaking up for their own condition. It’s authentic when it’s not a parent speaking, but an actual person who lives with it. In my own experience, I’ve seen city council members who’ve been impressed and listened to my story because it’s coming from a teen. I hope teens with food allergies will stand up for what they believe in because people will listen to us. One of your recent Spokin app recommendations was genius - we wish we thought of it. The Tile Mate! I have a Tile attached to my epi-pen pouch so I never leave it at home. You can set this device to alert you anytime you are a certain distance away, and can easily find it if you lose it. I was super excited to share it on the app. I recently lost my auto-injector at an event but was able to find it. It saved my family from having to spend hundreds of dollars! It’s hard to get the scoop before us - you just showed us a new food product! I recently found an allergy-friendly puppy chow, Safely Delicious. This snack is so tasty and with several flavors, you will be sure to find one you like! It’s also top 11 free. The company is based in my home state of Kansas but is available to purchase through the Spokin app and online. How did a Snickers bar help your dating life? I was on a date with a girl who innocently got a snickers bar, and I had to tell her that I was allergic to peanuts. Her picking that snack gave me the opportunity to tell her about my allergy. She was very understanding and going forward always asked if a restaurant or snack was safe for me. What’s a surprising place that you found peanuts? We have a black lab named George. A lot of dog food and snacks have peanuts in them so when we first got him, we had to do a lot of research to find dog food and treats that were safe for me. I’ve even recommended dog food in the app. It’s your junior year of high school - college must be on your mind! I checked out Kansas State and made sure to meet with their dining representatives. But I also saw the colleges in the Spokin app, and it was great to explore the schools people had recommended. Seeing that Vanderbilt was top-rated and knowing it was allergy-friendly made me eager to visit and consider it as a real option. Why are teachers your secret weapon in food-allergy preparedness? My family moved when I was in 5th grade, and my new school was not experienced in handling food allergies. They did not know how to implement a 504 plan and teachers weren't willing to make accommodations for my allergies. Although this was difficult, it helped me realize that the solution to misconceptions about food allergies is more education. I realized I needed to start educating my teachers on food allergy preparedness. If you can get the teachers on board, then students will follow. It has a positive trickle-down effect. Your favorite Spokin app surprised us - we had to ask the question twice! Sharing reviews is my favorite feature because if I add recommendations, then other people will too. It’s a two-way street! The app is constantly growing and I am happy to be a part of that! Daytona accepting an award from the city of Olathe. You’ve accumulated so many awards. Is there any space left on your mantel? I’m so happy that I’m able to offer my time. I was recently given the FARE vision teen achievement award. The work that I’ve done with the FARE walk was also recently featured on the local news, which was really exciting. 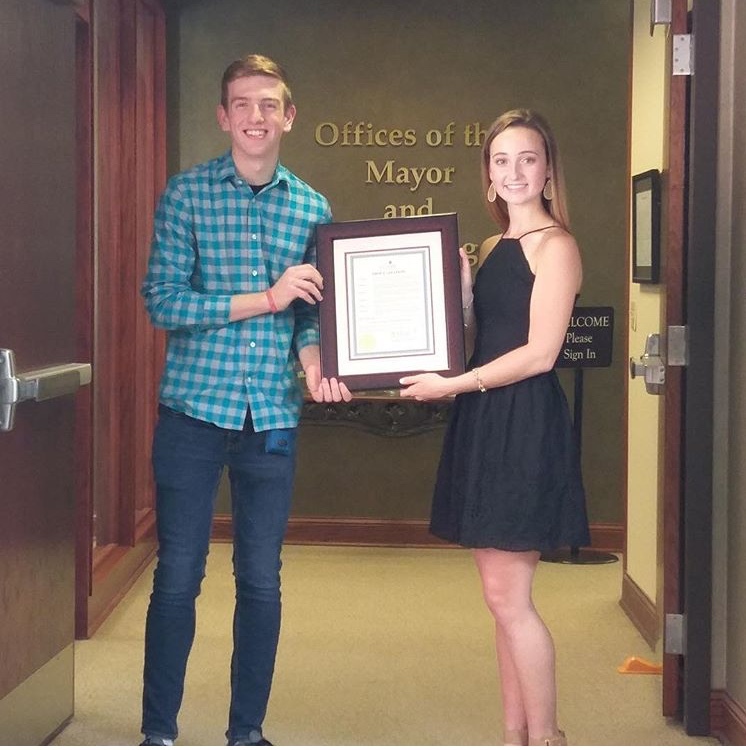 I also received a teen award from the Olathe Human Rights Commission in recognition of my dedication to helping others by establishing food allergy awareness activities. The awards are amazing but you’re also giving back on an individual level. Can you tell us about that? Recently, I helped organize a food-allergy awareness day at my school. I had a table where I showed classmates and teachers how to use an Epi-pen. People walked away with the knowledge needed to save someone's life. I also trained my school staff for food allergy-preparedness in the classrooms. I taught them about 504 plans, the various symptoms of food allergies, and simple things like making sure someone walks a student having a reaction to the nurse. I also was a counselor at Camp Tag. I think that they do a great job of keeping everyone safe. This camp is a great opportunity for young kids who struggle when socializing with others to understand that there are other people like them. You’re headed to Washington DC to accept the FARE vision award, how can the Spokin app help? I’ve already looked up DC and was happy to see a lot of recommendations there. Especially spots for pizza and burgers, those are my go-to’s! The running buddy carrier. I use this to carry my Epi-pens. They magnetically attach to your waistband and they never fall off or get in the way. Austin’s! It’s a local bar and grill and my family and I go there a lot. Favorite restaurant on the road? Red Robin. They have an allergen menu and are more than willing to accommodate food allergies. AUVI-Q, because if I were not able to inject myself, the device would talk through the process to whoever was giving it to me.